Greetings. 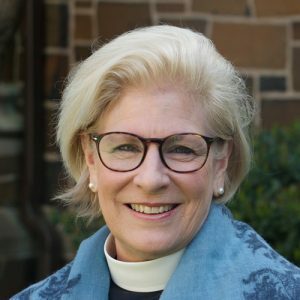 I am Susan Pinkerton, the rector of St. John’s Episcopal Church, and I am delighted to welcome you to our wonderful community. I hope you will take a few moments to browse through the many offerings we have at St. John’s. Whether you are new to the area, looking for a new church, or are unfamiliar with the Episcopal Church or the Christian faith, you will find a most welcoming and warm group of people at St. John’s. Our congregation is made up of folks from many different backgrounds and faith traditions. We’d love to tell you more about St. John’s, what we love about this place and these people, and the many opportunities for worship, fellowship and engagement with our community. You are welcome at St. John’s no matter where you are on your spiritual journey. There are several ways to become involved here, including attending our Sunday or weekday worship services and Bible or book study groups during the week, or coming to a music program, social event, or service opportunity. We are active in a number of ministries in the greater Hartford area and beyond that work to transform people’s lives. We also host occasional events especially for newcomers, including newcomers receptions and “A Day in the Life of St. John’s” programs; check the Events page to see what’s coming up. The information on this page answers some common questions. Please fill out the newcomer information form if you have other questions, would like additional information, or would like to meet with the clergy. We hope you will find St. John’s to be a place of peace and welcome, where your spirit will be nurtured within a loving and accepting community. What is an Episcopal worship service like? What if I’m not an Episcopalian? St. John’s welcomes everyone to our worship services. Many who worship at St. John’s grew up in other Christian traditions, such as Roman Catholic or other Protestant churches, or have no faith background. The Episcopal Church is part of the worldwide Anglican Communion, and we worship using the Book of Common Prayer. Our worship bulletins contain all of the prayers and readings for each service, along with guidance about when to sit, stand or kneel. Our Sunday services are centered on Holy Eucharist (communion), and all are welcome to receive the bread and wine, or to approach the altar rail and request a blessing instead (by crossing your arms over your chest). We also have confidential healing prayers offered at the 10:30 Sunday service; if you’d like to pray for yourself or someone else with a healing prayers volunteer, go to the baptismal font in the back of the church after you receive communion. You’ll notice some worshippers making the sign of the cross or bowing toward the cross or altar — these practices are a matter of choice, and you are welcome to adopt them or not as you wish. Music is central to worship at St. John’s. The congregation sings hymns and the adult and youth choirs sing anthems and chants. In addition to regular services of Holy Eucharist, St. John’s offers occasional services in different forms, such as monthly Celtic services (held in partnership with St. James’s Episcopal Church) centered on silence and contemplation, and monthly Sunday evening Evensongs, featuring choral music and a beautiful, reflective setting in which to end one week and begin the next. The parish clergy are always available to talk by phone or in person to answer your questions. St. John’s also offers programs throughout the year that discuss Episcopal belief, practice and parish life, such as “A Day in the Life of St. John’s,” newcomers’ receptions, and Adult Inquirers classes, along with ongoing Christian education for both children and adults. If you are a baptized, confirmed member of another Episcopal Church, you can ask your current parish to start the process of transferring your membership to St. John’s. If you are a member of another denomination, or are not currently a church member, contact us to discuss your situation and what is required for becoming a member, which may include baptism, confirmation, and/or being received into the Episcopal Church. St. John’s is a family-friendly parish and your children are always welcome to stay in church with you. We encourage you to sit up front, as children will be more engaged if they can see and hear what’s going on. Please do not feel you must rush out of church every time your little one makes a sound; your children are welcome here just as they are! A staffed nursery for children age 0 to 5 is available on Sunday mornings from September to June (during the summer, the nursery is open for families to use but is not staffed), as is Christian education for all ages and a youth program for middle and high schoolers. You’ll see people at St. John’s on Sunday mornings dressed in their finest, and others wearing jeans. We’re interested in you, not what you wear! St. John’s has two parking lots—one on the north (front) side of our property, along Farmington Avenue, and the other on the south (back) side of the property. There are additional parallel-parking spaces (including two handicapped spaces) along the driveway just outside the big red doors facing Farmington Avenue, and some diagonal spaces along the back of the building (including one handicapped-parking space). All parking on the property can be accessed via our two entrances—one on South Highland Street and one on Farmington Avenue. You may also park on neighborhood streets; please observe all parking rules and signs. Yes. There is an accessible ramped entrance on the back (south) side of the church building. The nave, education wing, parish hall, parish office, and most meeting rooms are on the accessible main level. There is an elevator to access rooms in the basement, and accessible restrooms on the main level. The church has hearing assistive devices, a wheelchair and a walker for visitors to use as needed; speak to an usher or one of the clergy if you need this or any other assistance. How can I find out more about programs and events? The Get Involved section of the web site features an event listing and information on parish committees, ministry groups and pastoral care programs. The Sunday bulletin serves as a weekly newsletter; we encourage you to take it home the next time you attend a service so you can read through the announcements. You can find online versions of each week’s bulletin here. We also send out a weekly e-newsletter; sign up for it here. If I can’t make it to church, can I access sermons and services online? Yes! For each main Sunday service (10:30 a.m. during the program year and 9 a.m. in the summer), we post a podcast of the entire service, a podcast of the sermon only, and a text version of the sermon. You can find these resources on our main Service page. If you would like more information about St. John’s, please complete and submit the form below. A clergy person or staff member will be in touch with you soon. Which St. John’s programs would you like to learn more about? Is there anything else you’d like to ask or would like us to know? Please explain.